A gout attack is a common reason patients come to our office. But patients experiencing their first gout ‘attack’ do not understand why they have been suddenly afflicted with unbearable pain in the their foot. Frequently the patient wakes up to a throbbing pain in their toe. Gout is an inflammation of a joint, often the big toe, caused by an excess of uric acid in the blood. Gout can affect other joints in the foot or larger joints in the body as well. Uric acid is a naturally occurring chemical in our body. When levels rise above normal uric acid can become a solid crystal instead of remaining dissolved in our blood serum. When uric acid crystals form in a joint like the big toe the surrounding tissues react by swelling, causing redness and pain. Lots and lots of pain. Some patients come to the office during a gout attack with their shoe dangling in their hand – their foot too painful to fit into a shoe. 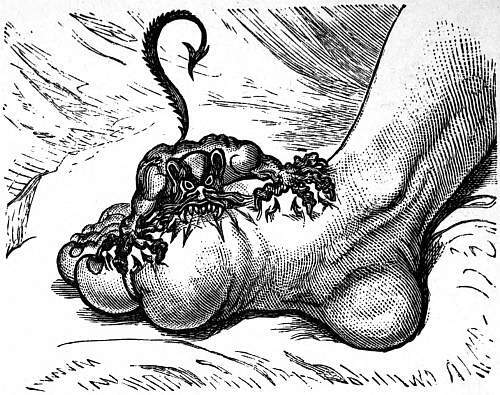 And gout has been a frequent topic of literature and the arts as illustrated above. Gout’s reputation is due in part to the terrible pain and in part because it has been identified as a “rich man’s affliction” associated as it is with overconsumption of meat and alcohol. Abnormally high levels of uric acid can be caused by diet. Eating large amounts of foods high in protein such as meat or shellfish and/or drinking too much alcohol (but not wine), are frequent culprits. And there is an association of gout with obesity and high blood pressure. Consuming large amounts of high fructose corn syrup as well as certain medications such as diuretics (“water pills”) can increase level of uric acid too. Sometimes patients will develop a gout attack after their dose of a diuretic has been increased. Gout is estimated to affect about 2% of the population and occurs in men and women. Treatment for a painful gout attack (acute gout) generally includes the drug colchicine, now known as Colcrys together with a non-sterioidal anti-inflammatory. Even with medications the pain and swelling may take a couple of weeks to fully resolve. Patients should also stop eating foods which increase uric acid levels and switch to a dairy diet including whole grains. Coffee has been reported to lower uric acid levels and some people maintain that drinking black cherry juice helps reduce the pain of a gout attack. A steroid injection around the affected joint can provide quick relief, if needed. The treatment for continued elevated uric acid levels and/or recurrent gout attacks requires long-term medical management. The patient should discuss with his or her primary physician the best treatment. It will probably include modification of diet and/or a uric acid lowering drug such as Allopurinol or Uloric. Conditions besides gout can also cause a joint to be swollen and painful. Making a definitive diagnosis is important as the treatment for other conditions, such as an infection and abscess in the joint is markedly different. Gout can be confirmed by identifying the uric acid crystals in the joint which are withdrawn via a needle. Patients are usually not to keen on that procedure however. A blood test of uric acid levels can by helpful, but not during an attack when the levels may be falsely low. A swollen painful joint which occurs after every big steak and beer dinner is also highly suggestive of gout.